Duties: Planning menu, Ordering raw foods and spices, Overall restaurant management, including Supervising cooks, Supervising and training kitchen staff members to assure recipe, cooking, and quality control, Utilizing food surplus and leftovers in a proper manner, Forecasting the probable number of guests for consumption of food depending on the day of the week, weather conditions, events and market conditions, Managing portion control and cost control. Creating daily specials, as well as special requests from patrons, as needed, Managing daily operations, Coordinating kitchen assignments and Scheduling kitchen staff in a cost effective manner, Responsible for Hiring and discharging of kitchen staff, if needed, Responsible organizing the customized dishes and importing Indian cooking equipment, as needed for the kitchen, Tandoor (Indian clay ovens), Educating the wait staff / servers to portray the recipes and ingredients accurately to the guests, Establishing and enforcing nutritional and sanitation standards, Assuring compliance with all federal, state, and local laws and regulations, Improvement in quality, taste and variety of vegetarian and non-vegetarian Indian dishes, Responsible for enhancement of the restaurant standards to meet the international grade of culinary. Assuring compliance with all federal, state, and local laws and regulations. Organizing the customized dishes, as needed Follow up with the servers to portray recipes and ingredients accurately to the guests. Duration of the job: Starting from 01/01/10 Ending 12/30/12. Job Site: 418 State street, Santa Barbara, CA-93101. 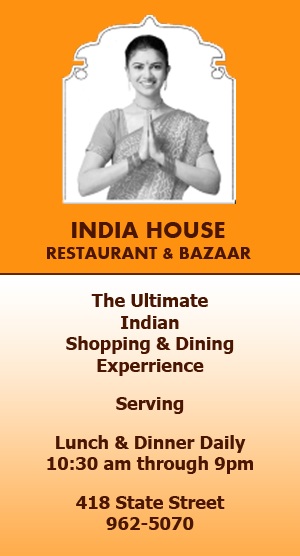 Send Resume to: India House, 1624 A chino Street, Santa Barbara, CA 93101. Looking for one person with IT know-how .knowledge of E-commerce, must have Indian goods knowledge , can be able to check, manage & design our website. Good salary. contact through E-mail.